Please take a look at the picture below. When we create an object in java with the new keyword, we are getting a memory address from the OS. a) How can I convert this string to binary? b) How can I get one integer variables address? That is the class name and System.identityHashCode() separated by the '@' character. What the identity hash code represents is implementation-specific. It often is the initial memory address of the object, but the object can be moved in memory by the VM over time. So (briefly) you can't rely on it being anything. Integer.toBinaryString() will give you an integer in binary form. It is possible using sun.misc.Unsafe : see this great answer from @Peter Lawrey -> Is there a way to get a reference address? That is the output of Object's "toString()" implementation. If your class overrides toString(), it will print something entirely different. This is often confused with memory address because if you don't override hashCode(), the memory address is used to calculate the hash. What you are getting is the result of the toString() method of the Object class or, more precisely, the identityHashCode() as uzay95 has pointed out. "When we create an object in java with new keyword, we are getting a memory address from the OS." It is important to realize that everything you do in Java is handled by the Java Virtual Machine. It is the JVM that is giving this information. What actually happens in the RAM of the host operating system depends entirely on the implementation of the JRE. In Java when you are making an object from a class like Person p = new Person();, p is actually an address of a memory location which is pointing to a type of Person. When use a statemenet to print p you will see an address. The new key word makes a new memory location containing all the instance variables and methods which are included in class Person and p is the reference variable pointing to that memory location. Not the answer you're looking for? 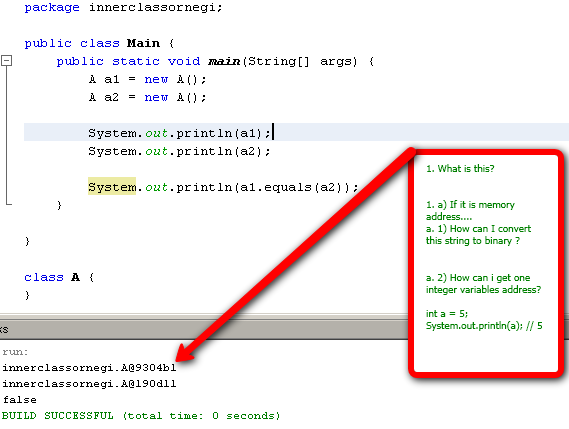 Browse other questions tagged java memory-management jvm hashcode memory-address or ask your own question. What's the default value for an 'object' in java? Is there a way to get a reference address? Will .hashcode() return a different int due to compaction of tenure space? How to print an object's memory address?